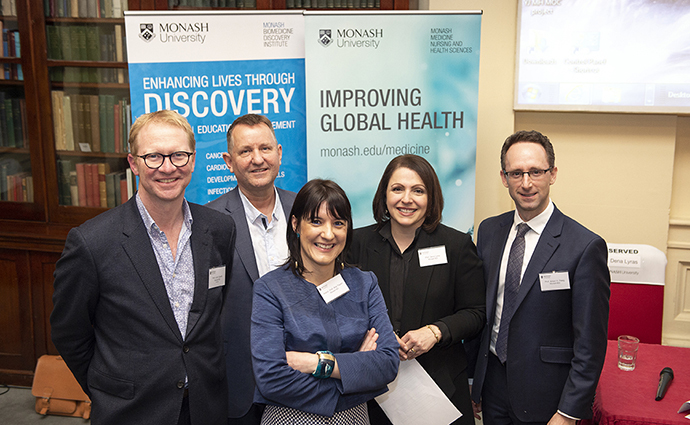 The topic was all things ‘superbugs’ at the Monash Biomedicine Discovery Institute’s (BDI) first biomedical science alumni event last week. On Wednesday 5 September, a panel of experts assembled to explore the frontiers of antimicrobial resistance (AMR) and answer questions from the audience about this serious global health priority. Professor John Carroll chaired the panel discussion. Before proceeding to discussion and questions, Professor Carroll first introduced the global context of AMR. He then outlined the ways the Monash BDI is tackling the problem, including establishing a multidisciplinary AMR team. Three of the Monash BDI’s leading AMR researchers made up the panel; Professor Dena Lyras, Professor Anton Peleg and Associate Professor Ana Traven. They were joined by medical sociologist Associate Professor Mark Davis, who has conducted extensive research into the social response to AMR. Each panellist began by introducing their perspective on the AMR problem. Professor Lyras defined ‘superbugs’ and how they have become a global health problem. Associate Professor Davis discussed how human behaviour is influencing the problem and the general public’s level of awareness of AMR, before Associate Professor Traven outlined what researchers are doing to combat ‘superbugs’. Professor Peleg concluded the individual presentations by offering the clinical perspective – what is happening at the ground level in hospitals. Professor Carroll then moderated a Q&A session, turning things over to members of the audience, whose questions ranged from the state of funding for AMR research, the latest types of ‘superbugs’ identified, the impact of antibiotics used in agriculture, what happens to us when the microbiome is disturbed, and the role of the immune system in fighting infections. With close to 60 guests in attendance, the discussion was lively and interactive. The event closed with a reception, where panellists and guests continued the conversation. The level of engagement and enthusiasm displayed by the attendees demonstrated the success of this inaugural biomedical science alumni event.